Mayo Sports Partnership along with Davitt College Transition Year Students & Castlebar Sports Forum are pleased to announce the 6th Annual ‘Mayo Sports Partnership Mini Mini’ Fun Run for Primary School Children in conjunction with Mayo Day. Suitable for boys and girls of all ability ‘Kids run for fun’ is the theme. The ‘Mini Mini’ will take place at 12.05 pm directly after the start of the Women’s Mini Marathon. 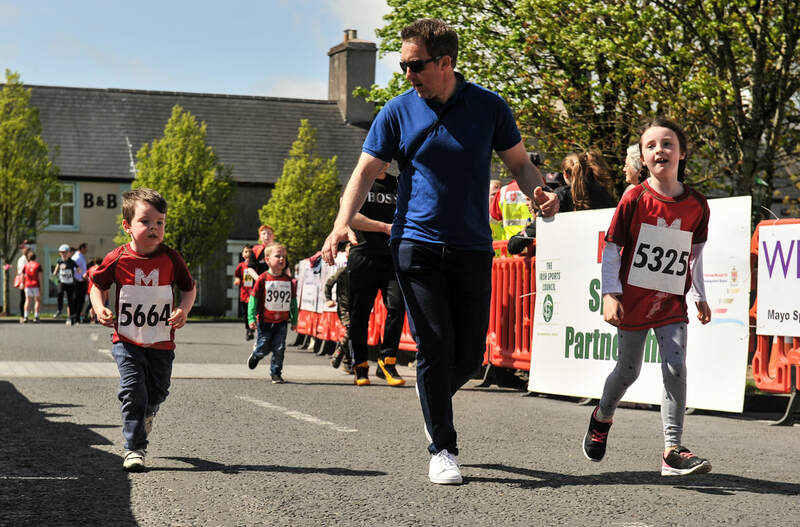 “This is Mayo Sports Partnerships 6th Annual Mini Mini Fun Run focusing on encouraging children throughout the county to become more physically active. In 2018 we had a record number of children participate in the Mini Mini along with parents, grandparents and guardians it was a spectacle of excitement, colour and magic to the county town adding greatly to our flagship event the ‘Western People West of Ireland Women’s Mini Marathon’. Once again we are delighted to work in partnership with the Transition Years from Davitt College on this project. We would be delighted if you would bring the event to the attention of schoolchildren, parents and other teachers. The Mini Mini Fun Run is free of charge and open to children of all abilities.